The DVA 1714 is a compact general purpose wide band analog distribution amplifier suitable for analog SDTV and HDTV video signals. The module can also be used for analog SDTV Bi-level sync pulses, black reference and analog HDTV Tri-level sync pulses. 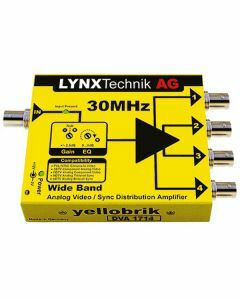 Features include an Input clamp with user adjustable gain and cable equalization.